Despite its location almost smack in the center of the Caribbean Sea, the island of Jamaica doesn’t blend in easily with the rest of the Caribbean archipelago. To be sure, it boasts the same addictive sun rays, sugary sands and pampered resort-life as most of the other islands, but it is also set apart historically and culturally. Jamaica is a favorite travel vacation destination for vacationers in the Caribbean. From Negril’s beautifull beaches to Duns River Falls tours in Ocho Rios to shopping in Montego Bay, Jamaica has all that a tourist could ask plus much more. Jamaica’s cultural center is in its capital city of Kingston. Kingston is a preferred vacation travel destination for those interested in Jamaica’s history. Shopping in Jamaica is an experience in and of itself. The island’s vendors peddle wares of all kinds, from local hand-made crafts to imported designer watches and perfumes, all at prices that can seem like a steal. Bargaining in the markets of Jamaica is a local tradition. If you choose to do so, be sure not to approach a vendor regarding an item unless you intend to buy that item. Ask the price, and then act disappointed and begin to walk away. If the vendor wants to lower the price of the item, he may offer a discount as a special treat for you as a visitor to his country. At this time, determine how much you would like to pay for the item and suggest a price lower than that. Eventually, you and your salesperson will compromise somewhere in the middle. Just remember not to give up! Just about two miles (3km) west from the center of Ocho Rios is the popular beach and waterfall attraction of Dunn’s River. The waterfall cascades down 600ft (183m) forming cool pools among slippery rocks, and a favorite tourist pursuit is to climb to the top of the falls with a guide, enjoying being splashed by cold, clear mountain water en route. There is a restaurant on the beach below. 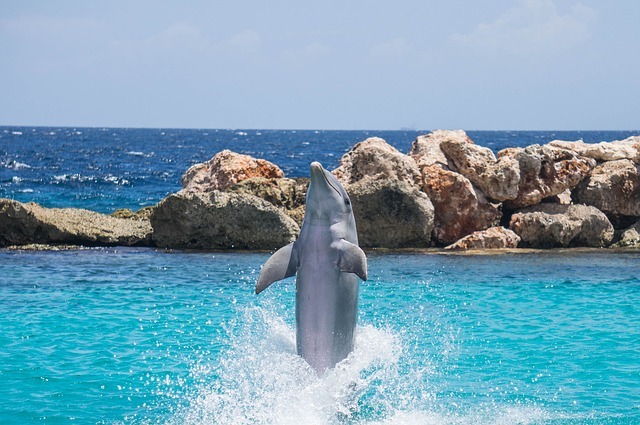 Alongside the Dunn’s river Falls in Ocho Rios is Dolphin Cove, where visitors can swim with a family of Bottle Nose dolphins. The natural cove is surrounded by four acres of lush tropical rain forest. The cove is also home to other marine species such as rays, eels and sharks as well as tropical birds, like the macaw. There is a gift shop selling souvenirs. Jamaica’s most prominent natural attraction are the caves on the island’s north coast, between Ocho Rios and Montego Bay, just a few kilometers from Discovery Bay and Runaway Bay. The huge labyrinthine limestone cave found here is 5,003 feet (1,525m) long and characterized by stalactites, stalagmites, overhead ceiling pockets, numerous chambers, light holes, and in its depths a subterranean lake. The reason for Negril’s recent boom as a tourist Mecca is centered on this seven-mile stretch of beautiful shoreline around Bloody Bay (so-called because of the fierce battle here between Columbus and the Arawak Amerindians) dotted with palm trees and carpeted with pristine white sand. Development has been restricted to palm-tree height, and despite the proliferation of guesthouses and hotels along the strip the natural beauty of the beach has not been compromised. It is now a beach renowned for showing off the world’s smallest bikinis; in fact clothing is optional and generally the option is little or nothing! Expect to be hounded by hundreds of vendors, offering everything from hair braiding to illegal ‘ganja’ (marijuana). Made famous by 14-year old Brooke Shields in the film ‘Blue Lagoon’, the sheltered cove is one of the most scenic spots in Jamaica and Port Antonio’s most celebrated attraction. It is fed by underground mineral springs, and is believed by many to be bottomless, although it is estimated to be about 185 feet (56m) deep. Surrounded by steep, green hillsides, the Blue Lagoon is a wonderful place to swim if one chooses to ignore the tales of sea monsters deep below the surface that are circulated by locals. Reach Falls, on the Driver’s River, is a strong contender for the ‘most beautiful place in Jamaica’, and are the island’s loveliest natural waterfalls. A series of cascades tumble into pool after pool of clear, green water and the main falls thunder into a pool deep enough to dive into. It would be a shame to travel to the heart of this complex culture without having at least one typical island meal. Probably the most famous Jamaican dish is jerk pork—the ultimate island barbecue. The pork (purists cook a whole pig) is covered with a paste of Scotch bonnet peppers, pimento berries (also known as allspice), and other herbs and cooked slowly over a coal fire. Many aficionados believe the best jerk comes from Boston Beach, near Port Antonio. Jerk chicken and fish are also seen on many menus. The ever-so-traditional rice and peas, also known as “coat of arms,” is similar to the moros y cristianos of Spanish-speaking islands: white rice cooked with red kidney beans, coconut milk, scallions, and seasonings. The crystal clear waters and year round warm climate makes Jamaica an ideal travel vacation for tourists seeking to soak in the sun. Fishing, scuba diving, wind surfing, and horse back riding are favorite daytime activities in Jamaica. In the evening fine dinning at Jamaica’s elite restaurants and resorts is a must experience. Jamaican’s unique cuisine coupled with enchanting reggae sounds bestow upon you a feeling of tranquility you won’t want to leave behind. The off season in Jamaica (roughly mid-Apr to mid-Dec) amounts to a summer sale. In most cases, hotel rates are slashed a startling 20% to 60%. Some package-tour charges are as much as 20% lower, and individual excursion airfares are reduced from 5% to 10%. In addition, airline seats and hotel rooms are much easier to come by. It’s a bonanza for cost-conscious travelers,especially . As the third largest Caribbean island (after Cuba and Hispaniola), Jamaica has hundreds of miles of beautiful coastline. The beaches of Jamaica are some of the finest in the Caribbean. 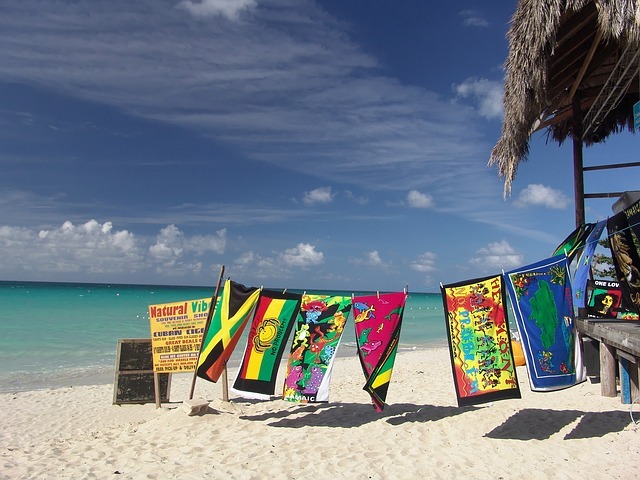 Some Jamaica beaches are lively, fun-filled places, packed with young sunbathers listening to loud reggae music, other beaches in Jamaica are serene, secluded stretches of white sand perfect for relaxing and unwinding. There are top Jamaica beaches in or near all the major resort towns. The long, crescent-shaped Turtle Beach in Ocho Rios is one of the most popular beaches in Jamaica. Like many other Jamaican beaches, it is now surrounded by hotels and resorts. For a more secluded beach in Ocho Rios, try the in-town Island Village Beach or nearby Reggae Beach, a few miles east of town. Runaway Bay is most famous for its great scuba diving, but the town also has some good Jamaican beaches. Most Runaway Bay Jamaica beaches are owned by resorts, but the Cardiff Hall Public Beach is free and open to the public. The area around Port Antonio in northeast Jamaica is known for its great natural beauty. Frenchman’s Cove, San San Beach, and the Blue Lagoon bring this beauty right to the sea; they are some of the prettiest beaches in Jamaica. Nearby Boston Beach is the place to go for authentic Jamaican jerk chicken. Montego Bay has some of the most famous beaches in Jamaica: Doctor’s Cave Beach and Walter Fletcher Beach. They are both divinely beautiful stretches of white sand, but because they are located in one of the most popular tourist destinations in the world, they can be some of the most crowded beaches of Jamaica. The crowds have an upside, though:Montego Bay Jamaica beaches have an almost permanent party vibe. Touring Jamaica can be both thrilling and frustrating. Rugged (albeit beautiful) terrain and winding (often potholed) roads make for slow going. Before you set off to explore the island by car, always check conditions prior to heading out, but especially in the rainy season from June through October, when roads can easily be washed out. Primary roads that loop around and across the island are two-lane routes but are not particularly well marked. Numbered addresses are seldom used outside major townships, locals drive aggressively, and people and animals seem to have a knack for appearing on the street out of nowhere. That said, Jamaica’s scenery shouldn’t be missed. To be safe and avoid frustration, stick to guided tours and licensed taxis. If you’re staying in Kingston or Port Antonio, set aside at least one day for the capital’s highlights and another for a guided excursion to the Blue Mountains. If you have more time, head for Mandeville. You can find at least three days’ worth of activity right along MoBay’s boundaries; you should also consider a trip to Cockpit Country or Ocho Rios. If you’re based in Ocho Rios, be sure to visit Dunn’s River falls; you may also want to stop by Firefly or Port Antonio. If Negril is your hub, take in the south shore, including Y.S. Falls and the Black River. U.S. and Canadian residents do not need passports but must have proof of citizenship (or permanent residency) and a return or ongoing ticket. A passport is the best bet, but an original birth certificate (or a certified copy) plus photo ID will usually suffice. Do check on the latest entry requirements before you travel, as the rules can change. Our advice is to always bring a passport when you’re going to another country. Other visitors, including British citizens, need passports that are good for a maximum stay of 6 months. The official currency of Jamaica is Jamaican Dollar and it is abbreviated as JMD. Jamaican Dollar is issued under the supervision of the Jamaican Government.